Coming into this fifth and final ODI series, England have already won the series by a margin of 3-0. The first ODI of the series was washed away by rain. Though rain played spoilsport in the remaining three ODIs, England managed to win all those three ODIs courtesy DLS method and won the series. The home team Sri Lanka went into the fifth ODI with nothing but to salvage some pride and they did so brilliantly with the bat in the first half of the game. The openers batted brilliantly followed by another superb partnership from captain Dinesh Chandimal and Kusal Mendis for the third wicket. Sri Lanka finished with a massive 366 for 6 on the board in their quota of 50 overs. Here are some of the statistical highlights from the first half of the fifth ODI between Sri Lanka and England at R Premadasa Stadium in Colombo. Both Sri Lankan openers registered their respective half-centuries to help Sri Lanka register their maiden 100+ partnership for the first wicket in ODIs played in 2018. Samarawickrama scored 54 runs off 48 balls with 8 fours while Niroshan Dickwella fell in the nervous 90s - 95 runs off 97 balls with 12 balls. This duo added 137 runs for the first wicket in just 19.1 overs before Moeen Ali cleaned up Samarawickrama with an off-spinner that turned just enough to dislodge the bails. On a lighter note, none of the fielders picked it up if the ball hit the stumps and that forced the standing umpire to take a review to check if the batsman is really bowled! The 137-run stand between Samarawickrama and Dickwella is the first 100+ first wicket partnership in ODIs for Sri Lanka in 2018. 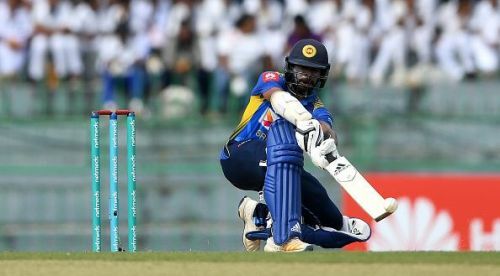 The unbeaten 83* run stand between Upul Tharanga and Danushka Gunathilaka against Bangladesh in Dhaka is their best opening stand before this fifth ODI against England.